Guaranteed to support a 300-pound man or woman. Can be set up or removed in three seconds, so no one is inconvenienced. 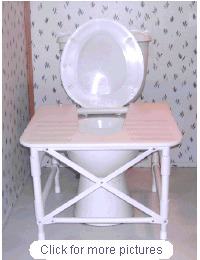 "We must bear in mind that, while we regard the use of the [chair-like toilet] as natural, we represent only a relatively small percentage of the world's population, and a percentage that may be said, in an absolute sense, to be wrong, insofar as we have allowed civilization to interfere with our biological functioning."